Unplug. Connect. Stretch. Breathe. Relax. 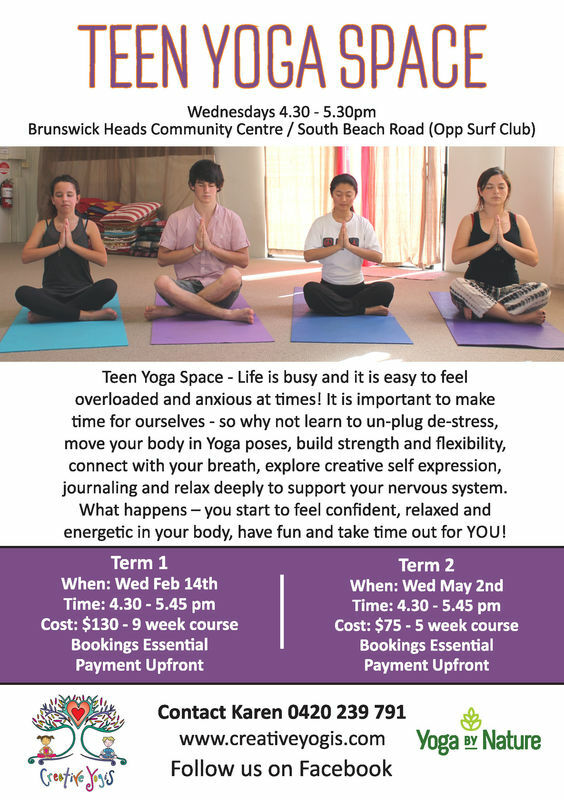 ​A specialised class created for Teens that offers them the time to connect with one another through the shared social experience of Yoga. Creating the time and space to unwind from exam stress, move and feel their bodies through a flowing practice whilst focusing on the breath to calm the mind, emotions and nervous system. Teen yoga builds strength, flexibility, stability and balance through the poses and explores creative expression through discussions and activities. In addition teens have the chance to support a healthy nervous system with the practice of deep relaxation at the end of each class. Teen Yoga promotes self confidence and resilience through the variety of practices leaving them feeling relaxed and energetic in their bodies. Having fun and taking time out is essential for this special population that need yoga the most! These regular after-school classes are held in Brunswick Heads, Byron Shire, Australia. Please call or text Karen to reserve your child's spot on 0420 239 791. ​There are limited spaces and the course fills quickly - look forward to seeing you soon! What I liked about yoga that made me keep practising was that it was a way for me to relax. It is one of few things we can do that gives our body and mind a rest from the busyness of life. It made my body feel great, stretching and moving my body in lots of different ways. I also learnt lots of things about myself and my body that made me confident and grateful. I keep practicing yoga so I can continue to experience all of these wonderful things. Each week in classes I enjoyed being in a calm space where I was able to take it slow after a busy week. I also enjoyed being with Karen, learning and being guided by her in the daily practice. The benefits I get from yoga are being able to stretch and exercise my body in an enjoyable way. Knowing poses and breathing techniques are easy and effective tools for when life and school is stressful. Yoga also helps me discover new ideas and meet new people that have a very positive influence on me and helps me have a positive attitude, perspective on life, and understanding of myself. SINEAD | Teen Yoga Student, 15 years. Copyright © 2018 Creative Yogis.